Analysis [Umbrella Strike] – Max 140% attack damage without special effects. Description Summons a goldfish that lasts 3 turns. The goldfish acts as an additional unit on the team and has 10% of Kagura’s max hp and 100% of her attack. This ability has a 3 turn cooldown. Analysis At max level, she can summon a goldfish with hp equal to 30% of hers and attack equal to 120%. This goldfish’s attack is AOE so is very efficient in farming. However, the AI does not seem to prioritize Summon: Fish on Auto. Description This ability lets one ally act immediately and buffing the ally’s attack by 10%. Ability cooldown is 2 turns. Analysis [Channel: Storm] – This is one of the best abilities in Kagura’s kit. This ability can let one ally act immediately as well as buffing the ally’s attack by 30%. However, the ally who receives [Channel: Storm] would not increase the Orb bar. This ability is very versatile both in PVE or PVP by letting your main DPSer attack more often. Analysis [Channel: Butterfly] – This ability lowers healing effect on one enemy by 50% as well as hypnotizing the enemy by 15%. However, this ability does not have much use at because, in PVP, you don’t know in advance if the opponent is a healer team. In addition, in PVE, there is not a stage that requires lowering healing effect as of this moment. Description AOE attacks enemy teams 3 times dealing 36% attack damage each time. In addition, [Purgatory] has a 20% chance to inflict a random debuff, that lasts 1 turn, on enemies. Analysis [Summon: Purgatory] – A three-hit AOE attack with a 30% chance to inflict a random debuff on the targets. This is actually a good ability to have for farming. In terms of PVP, the value of this ability is not the AOE damage but rather the random debuff. This is a good ability to have for both PVP and PVE farming. Description Kagura summons an Umbrella to protect the team. The team receives 20% less damage in 1 turn. This ability has a cooldown of 3 turns. Analysis [Summon: Umbrella] – This ability lowers damage received by the team for 35%. A useful ability to bring to PVE fights where receiving damage is unavoidable. This ability is suitable for crowd control + healing teams. Description Kagura summons spirits to protect one ally for 2 turns. If the ally dies while the skill is in effect, it will be revived for 2 turns. [Summon: Afterlife] has a cooldown for 2 turns. Analysis [Summon: Afterlife] – One of the best abilities in the game. This ability grants auto-revive on one team member for two turns. If the team member is defeated within these two turns, it revives for two turns. This ability is perfect for burst teams to be able to reserve main DPS for two turns longer, maintaining damage output. This is powerful in both PVP and PVE when the players are against a stronger team. Analysis [Divine Fire] – a passive for Kagura that can lower enemies’ defense by 40% and decrease 5% of the enemies for 2 turns, thus increasing damage output. This skill is essentially the same as Seimei’s passive. [Divine Fire]’s high damage, defense debuff, and AOE makes it very useful in PVE farming and PVP. A sample team set up for Kagura is to use Yamausagi (speed up), Ootengu/Ubume (damage output), Zashiki (Orb generator), Maestro (buff Ootengu/Ubume), Ibaraki/Balde/other DPSer, and Kagura (Medium Wind on Ootengu/Ubume, the other ability choice could be [Afterlfe] or [Purgatory]). 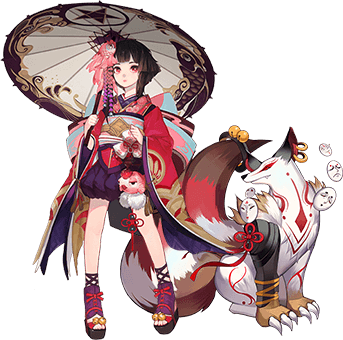 In contrast to her appearance as a little girl, Kagura is an extremely proficient Onmyoji. Her areas of expertise are PVE farming and PVP. While she is a valuable team member to carry fodders, Kagura really shines in PVP. The main reason is two of her abilities: [Channel: Storm] and [Summon: Afterlife].